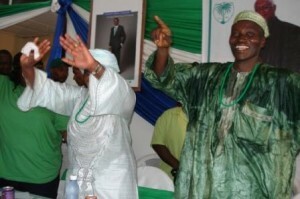 Reports reaching this paper indicate that the Sierra Leone Peoples Party (SLPP) is presently in a state of shock and confusion over the declaration made by the former flagbearer aspirant, Mr. Usman Boi Kamara, that he is neither a member of the All Peoples Congress (APC) nor of the Sierra Leone Peoples Party (SLPP). An Aide to Mr. Kamara who spoke to this paper explained that on Thursday, February 9 this year Mr. Kamara and other family members including the party’s Women’s Leader, Mrs. Isata Jabbie Kabbah, paid a visit to his home town of Karina in the North of the country where he was given a Chief’s welcome. The Aide also explained that a meeting was convened in his honour where the people expressed their appreciation to him for his astute political activities and unblemished character. The Aide also stated that when Mrs. Isata Jabbie Kabbah was asked to address the gathering she asked Mr. Usman Boi Kamara to break his silence and tell the people about both his political belonging and future plans as his continued silence has given rise to a lot of speculation and controversy. Mr. Kamara, the Aide stated, did not want to answer the question but that when the people pressed him to allay their fears he calmly told them that he belongs to neither the APC nor the SLPP but that he will tell his people very soon what his future political plans are. The Aide concluded that upon hearing this response a profound hush fell on the gathering and the SLPP stalwarts who had gathered at the meeting left unceremoniously without waiting for the meeting to end. As we were going to press we couldn’t get any reaction from either Mrs. Isata Jabbie Kabbah nor from any executive member of the SLPP.